it's even higher. Exactly. So I just loved things when you you improve the engine, I don't have to change the code, and it just runs a bunch faster. and this Sorry, go ahead. So you must have profile the cold fusion engine against a whole bunch of customers code to make sure, yes, these things we did. And there there are some of customer applications which we tested it, we can put it out on a white paper, because we are under NDA with our customers as well. servers, which we tested out, you could see that in the white paper you already mentioned, called box framework. And we tested with a couple of other frameworks as well, which has been listed out in the white paper. So I'll get the link for that white paper and put it in the show notes on the TeraTech site. end to end, right from your goal to the application to the database, you could monitor everything in one application server, the performance multiple set. external service, by external services, you mean things like CF HTTP calls, or elder Apple Mail, or the file system, SharePoint, any anything like that, where exactly going out to an office? Yes. it's great that you can monitor that. connector in most of the times become the bottleneck, it could, it could handle only a certain number of requests or response. And what what normally happens is when the performance goes down, then assess admin has to increase the number of threads on the connector. So what we are currently doing is when the application server monitor, and this is setting which which is disabled by default, so if you if you enable at the application performance monitoring to accept, but look at the number of connections request coming in, and there's an issue with the connector, it will turn turn it off so that you that can, it does not becoming a bottleneck for you. That's great, because you used to have to do do that manually. And it was almost like black magic to try and figure that out. What are those speed improvements have been made in ColdFusion? 2018? Okay. features. And we did a lot of performance enhancements on each and every language features as well. That's why what what do you see is, as soon as you upgrade to 20, 2018, you see that performance benefits without you doing doing anything. and that implementing your own caching engine is very well very simple. or or j CSS and or you can just have your own cash if you customize it. And this is in addition to all the other caching things that were already built into Cold Fusion News. exactly so if you even if you don't want to lock down your server using the lockdown installed on the of still want to do the manual process that installed that lockdown guide is still available for customers. so the log on what it does is once it does the entire thing, then it gives you a log report of what what it has been able to do. And there might be some instances it might not be able to lock down one or two functionality. So if you give you a proper report as to what has been done and what is still pending. Yes. But what we have seen is in recent times, people take security much more seriously. 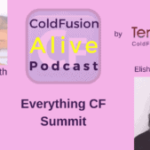 I mean, when was the last time there was a day zero hack into ColdFusion? I think that was around 2012 if I'm not wrong. I security something that I think every language has to take it up seriously and blab that we have been able to keep it up for so long. And yeah, hopefully we should be able to do it. we have a securities are not the man the most of I think almost all the developers and QA folks have to go through a security training. And Adobe also has a piece our team, the security team, which looks at the product, all the products and so we have three layers of protection going in to the product. That is great. And clearly there's a management focus on security as well. I know when I talked with trivia, he was very clear that you know, that we can pull him in if it's a security issue. Yeah, they believe they do everyone. know from a security perspective, that's all we had. code profile which walks through the code and sees if you are building from, let's say, 2016 to 2018, you run the file, and it will tell you what are the code changes that you want to make. And if there's any feature which has been replicated, and in 2016, we came up with something called as a security code analyzer. so we've talked about performance improvements in the performance monitoring security, I think it's time to look at the new features and CFL. So I know one of them I have I was excited about was the whole asynchronous programming, maybe you can tell us about that. and what we did was be complete completely revamped the UI for the admin portal. So why if you log into your admin page, you'll see that the UI has been completely revamped aware, it's easier to access all the settings, and it will just search for whatever settings you need. it and 2018 that is great. Making that more modern than easy to use, definitely helps. And there's a lot of amazing settings in there to to look at. what why you did this and what it achieves. what's the next feature you're going to tell us about. one of the key things which I like the board that was, you know, you could make changes to the REST API is without the 2016 and all What do you have, if you make any change to your REST API, you have to restart the application with 2018 You don't have to do that. right. And also what what I'll do in the show notes sign I know we were covering so many things here. And we can't go into detail of these each of these things. But what I will do is I'll put links to the you know, detailed info on the Adobe site on each of these features in the show notes. So if any of these cash listeners attention particularly then we'll put further and fall on those that you can you can go down and learn more about him and I will interview some of the coffee and engineers to get the real inside scoop on it as well. So I know one new feature you added in was rebel processing for read evaluate print loop so you can run CFL father command line, yes, bit about that, because that sounds quite intriguing. and you can use this right batch files, for example, you're seeing a server config, you know, using the admin API or or anything else you really want to have cold fusion for really becomes a little batch processing language is doing tasks. So instead of having to learn pole or some other scripting language, you could do the scripting in cold fusion. that's great event at the end. And I know that's been available through command box for a year or two. So grey, the Adobe notice that and add that into cold fusion 2018.
comment exchange? Tell, tell us about them. year PDF as the functionality of you know, you could add comments to the PDF files. Now, what we could do is we could easily export the PDF files from one PDF, one PDF document to another, and you could even portion where the comments needs to be placed in the destination file. So you as an approving authority for some insurance application if you approve it with some comments. And if you want to archive that, you would ideally remove that when you're sending it to the customer, you will remove the comments. But if you are going to archive that you might need you might want to archive it along with your comments. So this makes it much easier. let's say if your company has a particular metadata, which you want to have a to copyright notice who are thinking from, what's your company name, how it should be specified, and your logo. And you could do all that by just standardizing the PDF metadata. So no matter who creates the PDF, who's logged in us to play the PDF, it will be standardized across in the organization. and then it also does support all those form fields in PDFs or a Yes it does. So you can have a dynamic PDF, which, you know, you maybe users can fill in fields, all kinds of stuff. Why. and then what about the metadata in the PDF? See, can you update that as well? so it has a language called BB XML to using that you could leverage what or functionalities that you asked for. Hmm, wow. So cool. Any other new language features we should mention? For the time being? I think these are the language which game on my head. Okay, well, no worries. If something comes to you later, let me know. And I'll add it in the show notes. I think we've covered a lot of things here. So we we do have some questions from the audience. One of the questions was, whether you have any updates on educational books or training around cold fusion. don't they don't even have to write the curriculum, you can share with them what you have, and they can tweak it as they want and then present a course on it. Yes, I am. That's amazing. I I'm wondering what would it take to get hundreds of colleges and universities to have a cold fusion course in Britain them on? Yeah, we will be very interested in helping them out. all you could do, you could reach out to us for to get that license be what you do, what you do is you reach out to us at Adobe corporation@adobe.com. And what we need from you is your ID proof. And we will send across the serial number for builder and coefficient standard. that's not covered by this is all for personal use. If they want to learn more than that possible. That is a sport. That's great. I think we need to get the word out on that, you know, yes, maybe I'll do a blog post all about education and cold fusion and see if we can get some more excitement there. Because I know a lot of higher education, universities, colleges use cold fusion. So it seems to me would make sense to get them teaching it as well. fabulous is exciting news. I know, a lot of developers like to get certified kind of helps them get a job or promotion. Yes. And of course, you know, just by going through the act of learning to take the certification, you just learn a whole bunch of stuff about the language you didn't even know was in there. other than that, I, to be honest with you, I haven't developed any big application, I just tinkered around with creating dashboards or manipulating my Excel or creating a batch file and stuff like that. healthcare company in Singapore, which showed me their application, which was written completely in cold fusion, and which basically manages the entire hospital, right, from patient registration to doctor scheduling to how the X rays are being scanned. And they literally run the entire cold fusion entire the entire hospital on a platform, which is written in cold fusion. you have seen what NASA is doing with coefficient you had heard at that see of summer, and we are seeing what worked way is doing and we have seen all the amazing customers what come up at sea of summer to showcase their application. So I'd never seen a language which was like 23 years old, those do anything like this, and it's still relevant today. And it will be relevant for more days to come. we had solidified most of the features side and then team is already working on it. 2022 we are still in the strategy phase where we are thinking about what are the features that we should look at. And one of the new things that we need to bring your time obviously, that's not hard and fast things are bound to change in the three years that for years that vital identity 22 comes into picture. But things are mostly solidified for 2020 people already started building the features. oh yes proper mail and mainland he'll he'll he'll always respond to emails immediately. have his email already. But and he also goes to a lot he was just at CF camping. Yes. And that's, that's another thing, which I wonder value, you could find them and almost all the conferences and he keeps on doing customer road shows as well. So you could find them at any of the space. you could reach out to either one of us, me, Alicia or Russia or anyone in engineering team, and we will send it send it across to Russia. So if you're not able to find Russia, you could always find on us. And there's always available on the Slack channel. And the most of my engineering team is also all the Slack channel and you could always reach out to one of them, and they will forward it to Russia for me. fully sold onto the platform. I know why there was one metric which john had circulated on told on NASA where any said like give me a million dollar more I could rewrite the applications that were written in conclusion I'm not sure about the million dollar I don't know it's 10 million or something like that. yes so CEO Summit India going to happen out of the Adobe download Adobe opposite Sylvan Bangalore. Michaela sorry, machine does an amazing job putting the CF cam into the box. You know the box guys? nothing else from my side does that keep doing what you have been doing the now and keep the faith that it will be will be still be supporting cold fusion and we are still here. Well, yeah, you're still there. You doing a great job. It seems to be getting more successful every year. So thanks for coming on the podcast day. And you have an amazing day.